If you've seen the Broadway musical Wicked, chances are you know who Galinda is ;) And although this popular girl's character was on the vain and capricious side, she was also beautiful, bubbly, hilarious and absolutely entertaining! She kept me laughing in my seat while watching! Now let's focus on Guh-linda's (this is how she pronounces her name) good points because we seem to have found a mini version of her in our little daughter! hehe! We just found these photos so funny and amusing! My husband was the one who actually pointed it out because I had no idea Audrey's been coming up with all of these poses (I was in the picture too carrying Natalie - and yes, I cropped myself out - my poses weren't entertaining enough for this post hahaha!). 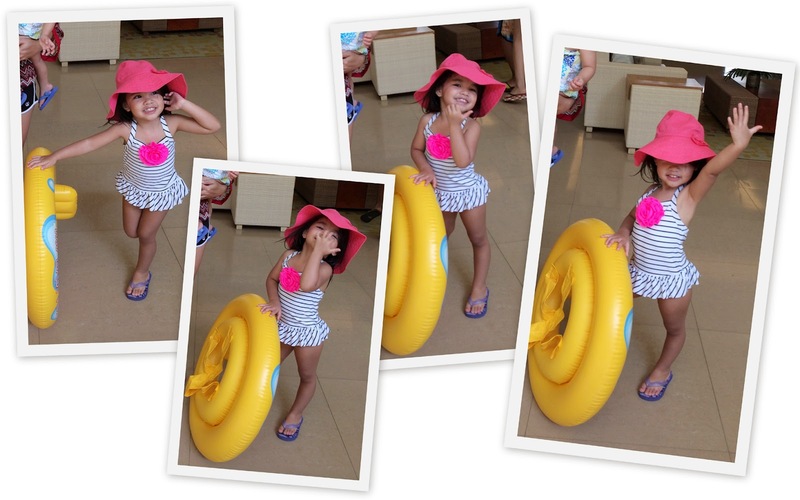 that cute floppy sunhat and girly swimsuit? :) tee hee!